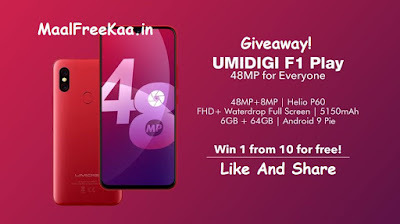 Win UMIDIGI F1 Play FREE. Grab the chance to grab your 48MP beast Umidigi F1 Play smartphone for FREE Total 10 winners! The giveaway will be ended one hour before the open sale of UMIDIGI F1 Play. Winners should contact us within 7 working days The prize will be shipped out within One month after the UMIDIGI F1 Play starting sale. Winners are solely responsible for all applicable taxes associated with receipt of the prize. 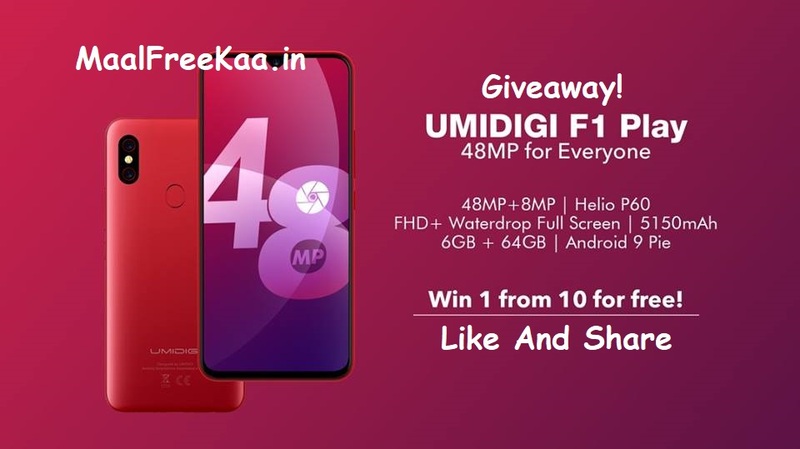 Participate now to win free UMIDIGI F1 Play smartphone. we’re giving away another a brand new Android phone to one lucky MaalFreeKaa.in Readers. Test your luck in this week's Sunday giveaway and you could win a brand new UMIDIGI F1 Play. This Giveaway based on Gleam Software you can follow all setup and task to click button one by one.